Chocolate Chip Coffee Cake – An incredibly moist, streusel coffee cake is loaded with semisweet chocolate chips and a hint of cinnamon to make for the best treat to enjoy with your morning or afternoon coffee. I wake up with a sweet tooth almost everyday, so, naturally, coffee cakes were always a treat I could get on board with. It all started with this incredible classic crumb cake that stole my heart as a teen. Now, my tastes have matured and my sights are set on a slightly more adult version – chocolate chip coffee cake. The story of this coffee cake begins back in college. I had a friend working at Einstein’s Bagel Bros. and he highly recommended the chocolate chip coffee cake that they sold. Being that my friend was not a huge chocolate person, this recommendation had extra weight to it. And sure enough, the coffee cake blew me away! It was so super moist and the chocolate chips we perfectly melted from a quick time in the microwave. It was messy to eat but worth every bit of chocolate on my hands and face. I was in love. So naturally, I had to try to recreate this cake at home so a) I could keep enjoying this for years and years and b) so you could too! To make this coffee cake, it’s very similar to the blueberry coffee cake I shared with you guys last August. You make a cake batter, add chocolate chips and then top with a streusel topping. Then, you simply bake and wait a few minutes for it to cool before enjoying. You can’t get much simpler than that! This cake is really so incredibly simple to put together and will be ready in under an hour. Butwhat’s even better, you can make this cake whenever you have a cravings because you probably have all the ingredients in your pantry! When making the streusel, you HAVE to use cold butter. When the butter is cold, it keeps it’s shape better during the baking process so you have those pretty crumbs on top. This also means you need to keep the streusel in the fridge while you make the cake batter so it stays cold. Make sure to line the pan with parchment paper – it’s so much easier to cut the cake when you can lift it out of the pan by the lining and cut outside of the pan. If you have a dark pan (like I do in the pictures above), make sure to bake at 325 degrees instead of 350 degrees. The dark pans cook much faster so you’ll end up having crunchy edges before the center of the cake is done. I think this cake is best served when it’s still warm so no need to cool completely before digging in! Hooray! An incredibly moist, streusel coffee cake is loaded with semisweet chocolate chips and a hint of cinnamon to make for the best treat to enjoy with your morning or afternoon coffee. 1 1/4 cups chocolate chips divided. In a small bowl, stir together, sugars, flour, cinnamon. Add diced butter and begin to break up the butter into the flour to make crumbs. Place topping back into fridge. Preheat oven to 350 degrees (325 if you have a dark-coated pan). Line pan with parchment paper. Set aside. Add flour, baking powder, baking soda, cinnamon, and salt to a medium bowl. Whisk together to combine. Set aside. Add butter and sugar to the bowl of a stand mixer. With a paddle attachment, beat together until nice and creamy, about 2-3 minutes. Add eggs one at a time, mixing until combined. Scrape down the sides of the bowl to make sure it's all mixed together. In a measuring cup, whisk sour cream and milk together. Set aside. Add 1/3 of flour mixture to butter mixture and mix just until it's somewhat combined. Add 1/2 sour cream mixture and mix until combined. And second 1/3 of flour mixture and mix until combined. Add remaining sour cream mixture and mix until combined. Finally, finish with the last 1/3 of flour mixture and mix until combined. Add 3/4 cup chocolate chips and fold into mixture until evenly dispersed. Spread mixture into prepared pan and cover with streusel topping. Sprinkle remaining 1/2 cup of chocolate chips on the top. Bake in preheated oven for about 30-40 minutes, or until toothpick comes out clean when inserted in the center. Let it cool for at least 10 minutes before serving. Enjoy! 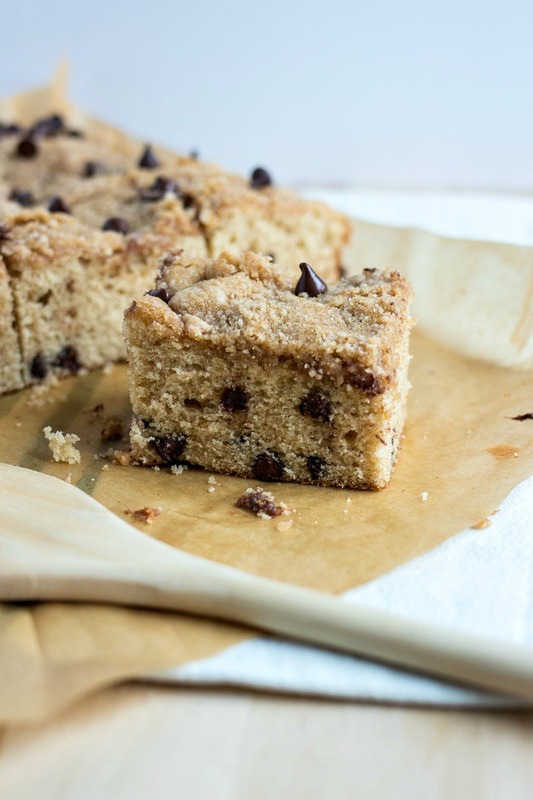 You just combined two of my loves… coffee cake and chocolate chips! This looks so yummy! I’ll be baking this with my little baker! Oh my! The Chocolate Chip Coffee Cake looks amazing! I am totally going to save it to make it for my family. This looks and sounds delicious. I can’t wait to try it. Pinning for later to make formy boys. They are going to love it! Ahhh this looks amazing! I love those kinds of cakes you can eat a bit warm where all the chocolate is gooey. Definitely going to try this one! Yessss! This is definitely that kind of cake! This looks so incredible! I love coffee cake, and this needs to be on my brunch table this weekend. I’m right there with you with chocolate for breakfast. Don’t you love having a recipe come out how you remembered it to be when you ate it many moons ago? This looks so delicious that I can’t wait to make it this weekend for our brunch! Yes, I love those kind of recipes! This looks so delicious in such a simple way, which for me personally, is the best way. Fancy desserts are nice to look at and all, but I find simple treats with simple ingredients always taste the best. And you cannot go wrong with a classic chocolate chip recipe! This cake looks so good! This is just the kind of cakes I LOVE to eat with my first coffee in the morning. I love the crumb topping – looks and sounds amazing! I’ve never had coffee cake with chocolate chips but it sounds so Yummy! Anytime you can have chocolate for breakfast I’m in! This looks so moist, simple and delicious! Never thought to put chocolate chips in coffee cake but what a great idea! You gotta try it – it’s incredible!